We exist in a society within which ‘life on the move’ is increasingly common, and supported by a growing array of mobile information and communication technologies. The research aimed to develop an understanding of travel-time use and explore ways in which public transport providers and passengers can benefit from this. This was an academic research project with John Urry at the Centre for Mobilities Research at Lancaster University, and with Glenn Lyons and Juliet Jain at Centre for Transport & Society at University of the West of England. 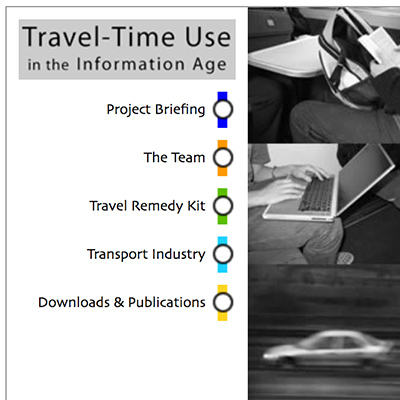 The Travel Remedy Kit, publications, and one-page research summaries are still available on the project website. Since the 1960s the basic treatment of travel-time in new transport schemes has remained the same: travel-time is unproductive, wasted time. Savings in travel-time typically constitute the majority of the benefit derived from a scheme. This research challenges this convention, starting with the assumption that travel-time is used productively. The car is often seen as the preferred means of travel because it is quicker and more convenient than public transport. This research may reveal that public transport does not necessarily need to compete in terms of journey time, if they can compete in terms of the ‘better’ use of people’s travel-time.